Please read through all the information on this site, Working Kelpie, Color Description, and use the resource links. If you wish to speak with someone about the breed, please contact one of the NAAKR Breeders listed on the Breeders page. Who better to answer your questions, then a purebred breeder. Where can I find a Kelpie? Please contact a NAAKR Breeder listed on the Breeders Page. These breeders are very pleased to answer questions regarding the Working Kelpie. We appreciate general questions about the breed and serious inquiries about purchasing a dog. How/where do I purchase a Kelpie? Your best source is to contact a reputable breeder. Serious inquiries should be made using the telephone, not e-mail. Please contact a NAAKR Breeder listed on the Breeders Page. These breeders are very pleased to answer questions regarding the Working Kelpie. Is my dog a Kelpie? You found a dog or bought a dog at a local shelter, etc. It is unlikely depending on your location that your dog is a purebred Australian Kelpie. It is easy to look at photographs of a breed of dog and "see" similarities to your own dog if you are not familiar with the breed in question. These comments come from experience in owning a mixed breed dog that closely, or so we thought, resembled another breed. A breed of dog is not simply color - it is conformation, temperament, characteristics, etc. 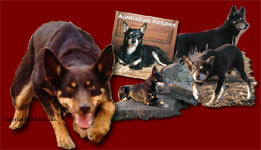 Remember that the Australian Kelpie until very recent years has been primarily a working dog located in rural areas. Please telephone or mail to the address listed below. Email is a secondary means of communication for the Registry. The next section deals with email protocol. Questions regarding registration or policy are only answered on letterhead mailed through the U.S. Postal Service. Telephone - 918-784-2643 Central Standard Time. Please call at a reasonable time - usually in the evening hours before 9:00 pm. You may find the line is frequently busy. If necessary, call during daytime hours and leave a brief message with name and telephone number clearly stated for return calls. Return calls are made within 4 - 6 business days. Can I email the Registry? Email is a secondary means of communication for us. We answer emails approximately every 14 days or so. If you require a quicker response please don't hesitate to telephone. If you do choose to communicate via email please use the Registry subject line or put something pertaining to the Kelpie or Registry in email subject line. The Registry does not open e-mail without mention of Kelpie or Registry in the subject line, or e-mail with attachments without prior notice, and does not answer unsigned e-mails or letters. Please go to the contact page for more information. How do I register a dog or a litter? Please go to the Registration Information (link found on breeder page) If you are inquiring about individual or litter registration applications or transfers that have been mailed to the Registry, please note that the process currently runs about 8 weeks from the receipt of documents at the Registry office. This is partially due to the volume of registrations received. How long does it take to process my registration/s? If you are inquiring about individual or litter registration applications or transfers that have been mailed to the Registry, please note that the process currently runs about 8 weeks from the receipt of documents at the Registry office to when they are posted in the return mail. This is due to the volume of registrations received and available office hours. I lost my registration certificate, how do I get another? Lost, stolen or destroyed registration certificates can be replaced. Please use the the affidavit form found on the Registration Information page. You must be the current recorded owner to receive a replacement certificate. There is a fee and the affidavit must be notarized. Banks usually have a notary.